From 1989 is celebrated this populous cycling tour that has become a benchmark of national sport and which is supported by the famous ascents of professional cycling. Its date is variable but it is usually fixed in the penultimate weekend of the month of May. The mileage exceeds the 100 kilometers. The test is included in the circuit of Cycling to Fund and circuit of Spain Great fund and Half fund. In 2015 it will be the 6 of June. Photographic report of the Navastur Cycling Club. 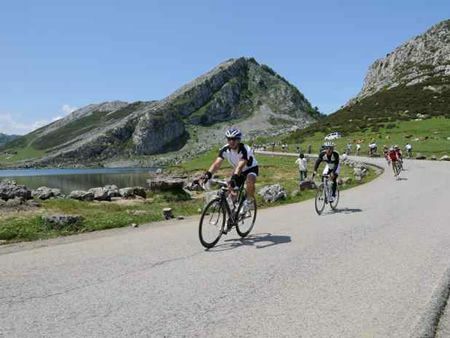 The cycling tour "Clásica Lagos de Covadonga" is one of the most surprising sporting events in the Bay of Biscay. With almost 2.000 participating, the snake is infinitely multicolored, and for both participants and for the public, the day is rewarding at all levels. For some, those who get on the bike, suppose the unique opportunity to face one of the most mythical tests of cycling. For others, the public is an equally exceptional occasion to witness an uninterrupted squad, the largest in Spain, which throughout the day fills the county roads of Oriente de Asturias with color and massive effort. Witness two thousand cyclists in a continuous going and coming is something extraordinary. The Lakes become here a mythical level within the reach of bike fans who come from all over Spain and abroad. The most prepared will spend less time, a large part almost all day, but here the important thing is to crown and fulfill a dream. Be part of Cangas de Onís, address Arriondas, and from here you can drive through the national 634 until Ribadesella Km. 23,5. Then the march continues its course by the As-263 address Llanes until arriving at the capital of the municipality, Km. 51 of the test where the first refreshment station is located to regain strength. From here by the LLN7 direction Pancar, Parres and Alto de la Turnería km. 62,5 The latter is a port of three and a half kilometers, the last two of which have gradient percentages that reach 12%. From here comes a long descent of 9 Km, with somewhat dangerous turns until Out of Mere, Km. 71,5. In this town it is linked to the As-115 road until the Alto de la Robellada Km. 78. Turn right, road As-114, descend again to Soto de Cangas Km. 93,8. Cross the As-262 road until Covadonga Km. 100 and Lakes of Covadonga where the test is terminated after 112 kms of hard peeling. A route that goes from the sea to the mountain and that is full of beauty. The effort is amply compensated with this landscape, ideal as only for the practice of bicycle touring. A day in which there will be plenty the spirits of the faithful public on the road, not even the thousand and one anecdotes in the different sections, nor the avatars and particular chronicles of the runners, who can choose to take it easy and face the journey in the company of friends, or else fight for the best classification, making the rubber in a continuous oscillation, leaving behind to then rejoin a more advanced group, finally descolgarse or put the turbo to the hunt of the strongest. And through the middle bird and monumental birds, and sections to pedal almost alone (although this is impossible except for those who go to the head), and false feints, and changes of rhythm and some joke in between if our lungs allow it . Someone hesitates to overtake us in the huesera, and far from getting nervous we control our pulsations, because here what matters least is the podium. It is simply about feeling good in our own state of form, of doing a good stage, of enjoying our time in the singular, of being the most regular for ourselves, and putting on the face of a cyclist in the good or bad weather that comes our way. this appointed day. A special day in which we have decided to test our capacity for suffering. So that the day is extraordinary, the organization He puts everything on his part and offers the best services to cyclists. Road safety is guaranteed by the Traffic Civil Guard, nor does the organization fail at the numerous intersections and intersections where there is always staff cutting traffic and signaling the route. It is no less careful roadside assistance for those who prick or suffer any unforeseen. The refreshments are generous. And in the end the facilities in Cangas de Onís available to runners once the test is completed are worthy of a professional test. There is no year that rendezvous cyclists do not meet at the time of departure, or organize a tribute to national cycling names. For all this, this classic of the Lakes of Covadonga is one of the most consolidated marches of the national panorama. The organization puts at the disposal of the runners' companions a free bus that will depart from Cangas de Onís five minutes after the start of the race and later will approach different points of the route to follow the course of the march. A response to "Classic Cyclo-tourism Lagos de Covadonga"